St. Patrick's Day is Monday. 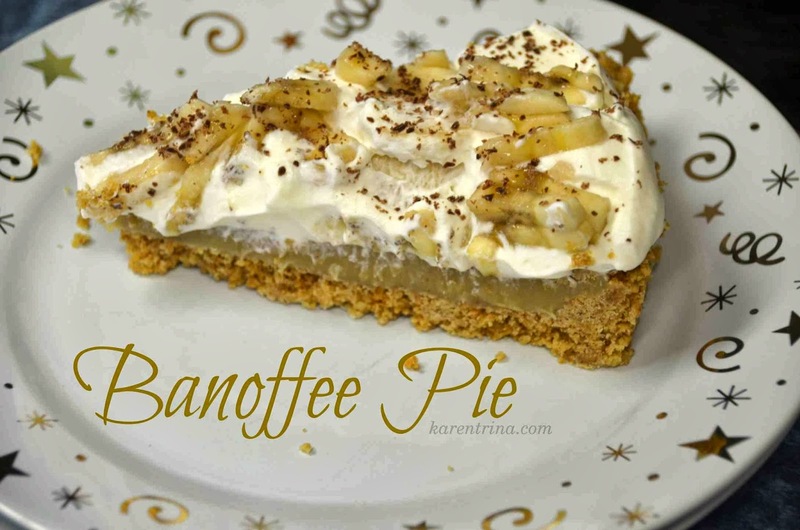 Today, I am sharing a Banoffee Pie recipe. My son discovered Banoffee Pie when he spent last fall in Belfast attending grad school. Technically, Belfast is in the UK, so this pie might not actually be Irish, but close enough. My son enjoyed this pie so much he sent me the recipe and requested that I make it at Christmas. The original recipe is on the Carnation UK website. I had to do some translating from grams to cups as well as substitute graham crackers for digestive biscuits. I don't think we really have anything like digestive biscuits here in the U. S.
For crust,mix the melted butter and graham cracker crumbs together. Press into a 10" springform pan, covering the bottom and about 1/2 way up the sides of the pan. Chill about 10 minutes. For filling, melt butter and sugar in non-stick saucepan over low heat, stirring constantly until sugar dissolves. Stir in sweetened condensed milk and bring to a full rolling boil. Boil for one minute, stirring constantly until mixture forms a thick golden caramel. Pour caramel mixture over graham cracker crust. Let cool, then refrigerate about an hour until filling is set. For topping, whip cream until soft peaks form. Fold in 1/2 of sliced bananas. Spoon cream mixture over caramel filling. Decorate top of pie with remaining banana slices. Grate chocolate over pie using fine grater. Refrigerate until ready to serve. This is a rich pie, but very delicious!